The ALIS Spider uses two RC4558 dual operational amplifiers. One is responsible for amplifying the MIC input on its channel 1 and the line input on its channel 2. The second is responsible for mixing the two signals, and amplifying them again. The gain of both amplifiers is controlled by a feedback resistance between their IN- and OUT pins in a similar way as explained on Wikipedia: Operational amplifier#Inverting amplifier. Changing the value of the resistor between those pins will change the value of the gain: raising the resistor proportionally raises the gain. The resistor of the MIC amplifier should be increased. Try first with 47 kΩ, and increase it for more gain is needed. 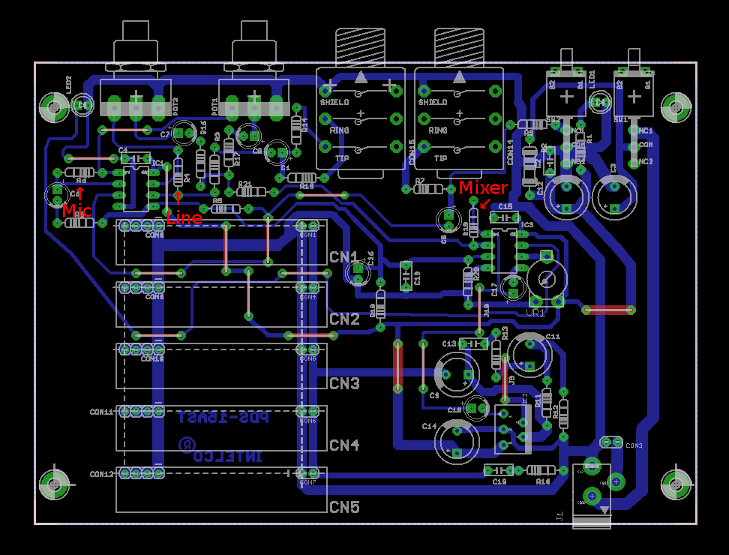 The resistor of the mixer amplifier should be at least 10 kΩ. Try this value first, and increase it for more volume if needed. See our reference for resistors color-codes. Resistors are very cheap (a few cents each) so don't hesitate to get resistors of several values to find out which is the best for you. It would be good to have more feedback from users about their favourite values. So don't hesitate to report back your findings.